LAS VEGAS (AP) — A zip line that swoops riders past the vintage casinos of downtown Las Vegas and under the giant video canopy of the Fremont Street Experience is now open for business. The lower zip lines on the $12 million SlotZilla attraction opened to the public Sunday after 14 months of construction, while a set of higher lines is expected to open a little later this spring. 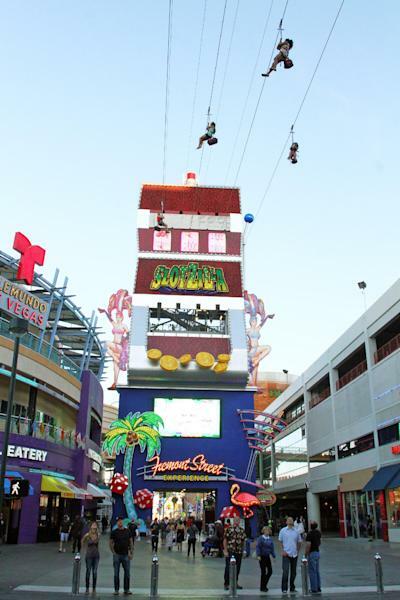 "People are really enjoying it," said Fremont Street Experience spokesman Thomas Bruny, who pointed out more typical zip lines take tourists over forests and lakes. "This one is unique because nowhere else are you flying over people and under the largest video canopy in the world." The high-flying rides start from a 12-story tower designed to look like a giant slot machine. 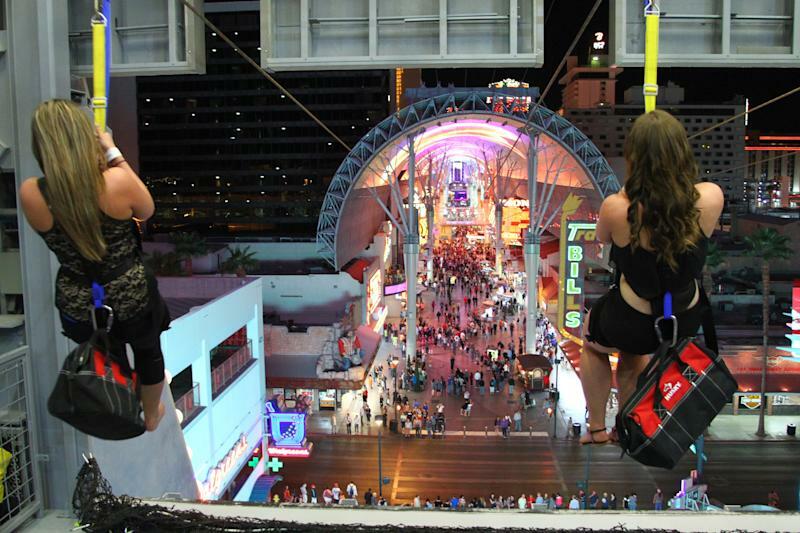 Riders can now take the 77-foot-high zip lines, in which visitors are harnessed in a sitting position and glide 850 lateral feet to a platform near The D and 4 Queens casinos. A "zoom line" opening later this spring launches riders from 114 feet up and sends them soaring in a horizontal "Superman" position 1,700 feet across the entire pedestrian mall. That attraction uses a power boost to ensure riders make it the full distance of the wire. Zip line rides cost $20, while zoom line rides will cost $30. The attraction is an expansion of a much smaller, temporary zip line that has for two years scooted families, newlyweds and Elvis impersonators beneath a long metal canopy that displays an hourly light show. That ride was intended to be a 30-day novelty, but it proved such a crowd pleaser the business community began working to make it permanent.